Cyril has collected photographs and views of all the old buildings that stood on the site of the Nelson Hospital and nearby, identifying the viewpoint of each one. Peter has gone through the manorial court rolls to trace the history of each holding from the late 15th century to the 19th. Also included are a Vincent Lines article from a 1929 edition of Wimbledon Boro’ News, information from the 1891 and 1901 Censuses and local directories, as well as several maps. identification, the photographs are lettered a through to w.
was probably absorbed within it. 1732 and 1827 in describing Braxtons, and the ‘Rush Tree’ is referred to in 1780.
tenements held from the lord of the manor at a fixed ‘quit-rent’ – quit of all other services and demands. tenant received a copy of the court roll entry as proof of tenure. 16th- and 17th-century copies of individual admittances also survive at Surrey History Centre and elsewhere. of the adjoining Leather Bottle Field (plot 57). surrounding Merton Rush as shown in the tithe apportionment map of 1844, including the plot numbers. approximately where the photographer was standing. Leather Bottle Field always seems to have been held by the owners of the adjoining Merton Hall Farm. rebuilt, there is no record that this was ever done. The field carried the ancient field path to Wimbledon. By 1897 the path had become Merton Hall Road in anticipation of a substantial housing development. A new Leather Bottle pub was built on the corner with Kingston Road in the following year. in a list of local victuallers in 1725,2 but by1727 the property was in the occupation of Simon Martin. Mary Gover and then Mary Freeman, who sold it in 1821 to John Edney, a Merton bricklayer or builder. Apportionment Survey was undertaken in 1844. In Hayes’ time it was known as the Old Leather Bottle. the alehouse in 1894, and purchased the freehold three years later. grocer, newsagent, stationer and removal contractor. Jenkinson’s daughter, Diana, was the tenant of his cottage at the Tithe Apportionment Survey of 1844.
in 1895, and the properties were sold to pay his debts. Parade built, apparently without any photographs ever having been taken of the previous buildings. if the ‘Rush Tree’ was the dominant tree in these pictures. tenure or occupation of Marmaduke Deacon and now or late Richard Fillmore. tenure of Thomas Whapham, to the value of £3 per annum, to be rebuilt) &c.
24.6.1742 Robert Dorrill deceased: 1st proclamation for heirs. None came. 9.9.1742 Henry Meriton of St George Hanover Square was admitted: Leather Bottle Field &c.
9.1.1758 Henry Meriton deceased to daughter, Ann Meriton of Chelsea, widow: Leather Bottle Field &c.
Ann Meriton to Thomas Chitty Esq, Alderman of the City of London: Leather Bottle Field &c.
daughters of Thomas Chitty, were each admitted to a moiety of the 3 copyholds, @ 6/8d each. use of Thomas Bond’s will: Leather Bottle Field &c.
15.8.1805 Thomas Bond held 14 commonings [also 30.7.1806 and 31.3.1807 prior to enclosure of Common]. 31.3.1807 Thomas Bond deceased to Essex Henry Bond, his brother: Leather Bottle Field &c.
26.2.1819 Essex Henry Bond to Rear Admiral Isaac Smith of Clapham: Walkfield and Randall’s Yard. Leather Bottle Field and cottage remained with E H Bond. 12.10.1819 Essex Henry Bond deceased: 1st proclamation for heirs: Leather Bottle Field and cottage. 3.6.1820 Essex Henry Bond deceased: 2nd proclamation for heirs: Leather Bottle Field and cottage. 4.10.1820 Essex Henry Bond’s copyhold lands forfeit to the lord for want of a tenant. Leather Bottle Field and the Common allotments. Guardianship granted to Charles Frederick Bond. customary tenements, held by C F Bond as guardian to Alfred M Bond, for up to 7 years. containing 1 acre 2 roods 34 perches. Also 3 allotments containing 7 acres 3 roods 12 perches. 26.10.1842 Proclamation for the purchaser of Alfred Marjoribanks Bond’s copyhold to come forward. 8.11.1843 Proclamation for the purchaser of Alfred Marjoribanks Bond’s copyhold to come forward. 18.12.1843 James Page was admitted to the copyhold: Leather Bottle Field and allotments from Common. particular property was sold in 1498.
several canons and two priors at Merton priory, obtained Braxtons, Redis and Hochynredis in 1501.
in 1555, also having been widowed three times, and her son Augustin Goffe inherited both properties. ended after 71 years and four generations. Palmer, publican of the Old Leather Bottle, took on a 28-year lease on 31 March 1876.
in the court rolls was Alfred Johnson, a grocer of 83 Hartfield Crescent Wimbledon, on 22 July 1898. Reads, itcame into the possession of John Salyng in 1501 and remained in the family until 1564.
those in picture o. There is another reference to ‘new messuages by the Rush Pond’ on 4 October 1820. Rutlish and his trustees also held the adjoining arable plot 85, as well as the White Hart in Kingston Road. you to the very spot. momentarily, to fancy oneself back in the times when Nelson roamed here. cottages have been left to harmonise with old Merton Rush. John Innes Society told, would have a place in local history. would have walked, or, better still, have come by carriage. erection or building be at any time erected or built on the said piece of waste. by a horse-drawn cart with a single large churn. Wimbledon Society Kingston Road looking south. P0336 At one time the Plough beerhouse occupied one of these cottages. Numbers 1 to 5 Merton Rush, taken from Watery Lane. over the premises of the Old Leather Bottle, can be seen. (bottom) with the ‘Motor Works’ on the right. early 19th-century rebuild of earlier ones. backs of some of the houses in Cross Row can also be seen. Picture e gives another view. Numbers 10 to 12 Merton Rush. The central houses in Dallett’s Rents. A similar view to that of Madeline Barker’s watercolour on the cover. Congregational chapel in Merton used a room herec.1814 to 1839. Photograph: R. Guy, November 1913.
horsedrawn vans are still parked in the same area. Photograph: R. Guy, August 1913. Part of the north side of Kingston Road, opposite Merton Rush. can be seen stables belonging to Long Lodge. Numbers 11 and 12 Merton Rush, looking south. Photograph: H.C. Archer, 5 August 1913 Photograph: H. G. Quartermain, John Innes’ architect. Wimbledon Society Merton Library Service 1898. Number 10 is the off-licence and grocer’s shop of George Nash. P0328 The former bakehouse is not smoking, as it is in picture j. On the left is the Morden Hall Dairy, established herec.1888. Numbers 13 to 20 Merton Rush. of front garden walls of these houses. Numbers 17 and 18 Merton Rush, looking south. Numbers 13 to 15 Merton Rush. 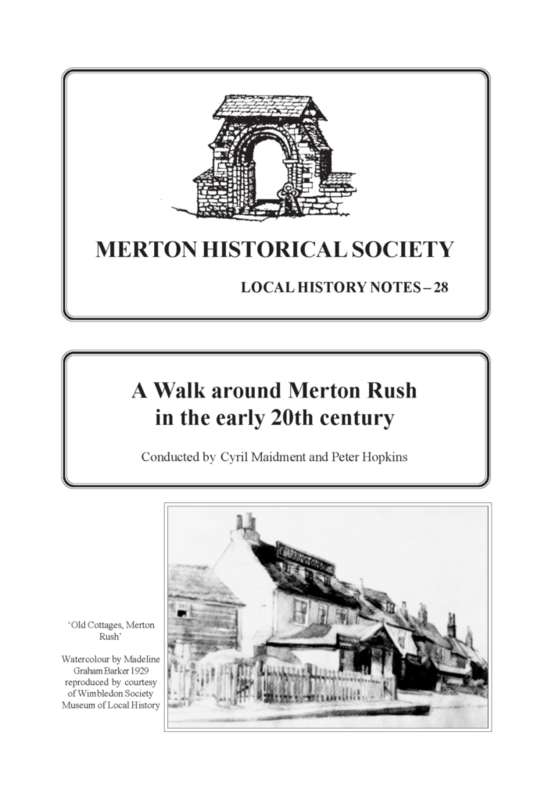 There were 20 addresses in Merton Rush. Five were in Cross Row. Only seven ‘front doors’ can be seen between numbers 13 and 20. Numbers 16 to 19 Merton Rush, looking southwest. manorial court rolls as having been an occupier. probably built the four cottages which preceded those shown here. These may be the replacements built in October 1786.
photo was taken before Merton Park Parade was started in 1906.
off-licence and grocery of George Nash. This entry was posted in Publications, Local History Notes and tagged in 20-century Merton, lhn, merton.